What is the best rated mattress on the market today? Discover what is the best mattress brand, the most popular type of mattress, and how to find a mattess that will give you a fantastic night's sleep! Consumers have many choices available to them when it comes to type of mattress, style of mattress, and price points of mattresses. Did you know there are over 800 mattress brands in the U.S. alone? It can become not only overwhelming, but also discouraging, trying to wade through all of the information online in the way of customer reviews and official mattress websites in order to make a decision on which mattress will best suit your needs! Hopefully you will find the information provided here helpful to you in your search for the best possible mattress. We've done extensive research on this topic because of our own interest in getting a great night's sleep! Keep in mind that mattress preferences are very individual and can vary with a person's weight, chronic pain level, and even age. While one mattress will feel comfortable to one person, it may not feel comfortable to another person. That's why it's vital for you to try out any mattress in which you're interested before making a final decision. Memory Foam Mattress - memory foam mattresses are a popular choice for some people who experience chronic back pain or joint pain from arthritis or fibromyalgia. Memory foam conforms to every inch of your body and supports your spine properly. Some people find that this type of mattress provides relief from chronic pain while others find it exacerbates it. Those who enjoy sleeping in a cooler atmosphere might find that a memory foam mattress retains too much body heat, making some people sweat while they sleep. Memory foam mattresses are made with a lot of chemicals, and cannot be used as soon as they arrive - they need to be aired out for several days due to odorous off gassing. Some people have reported severe health symptoms after using a memory foam mattress. For this reason, memory foam should not be used by people with multiple chemical sensitivities, or those who are sensitive to fragrances. People with allergies have reported fewer allergic reactions in response to a memory foam mattress. It could be because the foam is denser and naturally inhibits dust mites and allergens from entering the mattress. The reason for this is that most other types of mattresses have a lot of space for air to circulate, which provides a breeding ground for dust and dust mites. Overall, a high percentage of consumers are satisfied with their memory foam mattress. Prices begin around $800 and can reach into the thousands, depending on the brand name. Innerspring Mattress - innerspring mattresses are usually the first type of mattress a consumer will consider. They've been around for a long time and have a proven track record within the mattress industry. 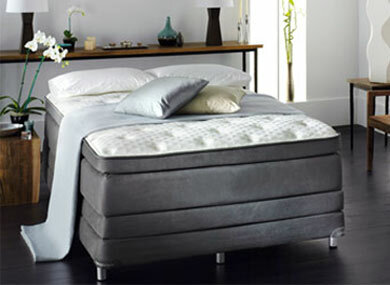 Innerspring mattress styles offer the most variety in the industry. Couples appreciate that there are styles within this category that feature individually wrapped coils, which means less jostling and movement when the partner moves around during the night. It's possible to find an innerspring mattress beginning at $300, but experts recommend looking at ones priced around $800 for a queen size in order to get a good quality mattress. Latex Foam Mattress - latex foam mattresses are relatively new to the U.S. market, but so far they seem to be a good choice for consumers who are looking for a mattress that is more environmentally friendly. The latex material used in these mattresses is a natural, renewable resource that could possibly be recycled into something new later on. Although chemicals are used to make the latex into a mattress, overall these contain less chemicals that most other kinds of foam mattresses, so outgassing is less when you bring a new latex mattress home. Latex mattresses do have a natural rubber smell, although a good quality latex mattress will usually dissipate the smell in a few days. They do not work for people with latex allergies. Consumers like this type of mattress because it provides excellent support, it's resistant to dust mites, and it breathes to allow good airflow. This means you won't experience the heat build up with a latex mattress like you would with a memory foam mattress. The price tag on latex mattresses is higher, with a queen size beginning around $2,000. Air Mattress - couples that want to customize their side of the bed to the firmness they enjoy most love the versatility of an air bed mattress. An adjustable air mattress is comprised of air chambers inside the mattress that are adjustable for each sleeper. No springs are included in the design of an air mattress. Some consumers reported that you couldn't sit on the side of the bed because the mattress won't support the weight. Price points begin around $800 and can be very expensive depending on the size mattress you choose. This is a list of the brand name mattresses that seem to consistently come out on top when it comes to consumer reviews. More and more consumers are looking for mattresses that are environmentally friendly and easier on allergies. There are at least six mattresses that come to the top of the list in this category. They include The Savvy Rest natural latex mattress, Lifekind OrganicPedic natural rubber mattress, Green Sleep natural rubber mattress, Soaring Heart Futon mattress, Eseentia, and Natura Eco-Haven. The customer reviews aren't as readily available on organic or natural mattress products, so it is more difficult to find the best rated mattress in this category, but the ones that are available name the six brands above as ones that are comfortable and well worth the hefty price tag. A queen-size organic mattress begins around $1,999 and can run as much as $3,400. Environmentally friendly products will cost a bit more, but people who own them find the beds extremely comfortable and find that their allergy symptoms aren't flaring up like they did sleeping on other types of mattresses. It's challenging to shop for just the right mattress, but if you know what is important to you, the search can be narrowed and you can find the best rated mattress for you and your needs. For example, do you want a mattress that will alleviate back or joint pain? You may want to consider a memory foam or latex mattress. Does your spouse roll around a lot and disturb your sleep? Innerspring mattresses featuring pocket coil systems could be your answer to fewer disturbances from your spouse's movements. Do you suffer from dust mite or other allergies, or multiple chemical sensitivities? Consider a natural, organic, or hypoallergenic mattress to alleviate your symptoms and sleep better. We've said it before, but we'll say it again - your body is the ultimate guide to the best rated mattress! Mattress comfort is a personal preference, so make sure to do your research and try out different styles and brands of mattresses before signing on the dotted line and opening your checkbook.